Sometimes it’s difficult to get over the negative misconceptions and stigmas that are prevalent in society. Whether it’s about animals, people, or even companies, it’s hard to go against what so many people are saying, but often times, you will realize that you for every person that says something negative, there are just as many that say positive things. When Greg Heynen met his wife’s Pit Bull / Labrador mix dog, he didn’t know what to think. 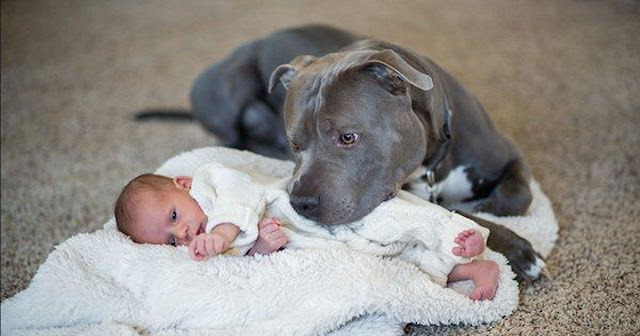 He was initially scared of having a dog around his newborn baby, but the following story really illustrates how his heart suddenly changed. We brought our daughter home in a car seat, and both dogs sniffed and licked her, tails wagging. I had to pull Zack away from her because he wouldn’t stop licking her. Zack immediately became my daughter’s protector,and when she was lying on a blanket on the floor, he always had to have one foot on the blanket. Zack was poisoned by some dirt bag neighbor kids, and we had one of the worst days of our lives. Watching my daughter say goodbye to him as he laid still on the kitchen floor, my wife and I were both sobbing.